Most bungalow-lovers are familiar with the Sherwin Williams’ Arts & Crafts color collection, the Eddie Bauer Home Bungalow Color collection at Lowe’s, and Pittsburgh Paints’ Chicago Bunaglow color collection, but there’s new color collection released earlier this spring that may also be worth a look. 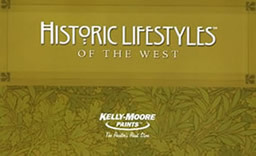 Kelly-Moore Paints has introduced a new palette called “Historic Lifestyles of the West.” Developed by respected color expert Robert Schweitzer (who wrote the book “Bungalow Colors Exteriors“), the collection contains 106 lovely, mellow colors inspired by the architecture of the late 1800s and early 1900s. The collection is dived by era/architectural style and includes shades appropriate for Victorian, English Revival, Spanish Revival, Arts and Crafts, Jazz Age and mid-century modern homes. Kelly-Moore Paints are available in Arkansas, California, Colorado, Idaho, Nevada, Oklahoma, Oregon, Texas and Washington. Would it be possible to get some paint chip samples? I plan to paint my bungalow next spring and am looking for colors to go with a medium-dark brown roof. You can order color samples from Kelly Moore by calling 1-888-KMCOLOR or by emailing them at colorsamples@kellymoore.com. Previous Previous post: A breath of Freshaire at Home Depot? Next Next post: What’s the deal with VOCs anyway?